Tourism Ireland were showcasing the best of Ireland to over 400 top international buyers from 40 countries at the ExploreGB 2017 exhibition in Brighton recently. Some of the world’s top international buyers from countries, including the US, Canada, Germany, France, Italy, Australia, China, India, and the Middle East, were treated to an overview of all that the island of Ireland has to offer visitors in 2017. ExploreGB formed part of Tourism Ireland‘s ongoing partnership with VisitBritain, along with 13 tourism companies from the island of Ireland. The two-day workshop allowed both organisations to showcase Britain and the island of Ireland to an influential audience of international buyers which would hopefully assist in delivering additional itineraries and brochure pages featuring both destinations. Their presence at ExploreGB also offered an ideal opportunity for Tourism Ireland to highlight the benefits of the to those in attendance from China and India. The visa scheme enables leisure and business travellers from both countries to make trips to Ireland and the UK on a single visa. 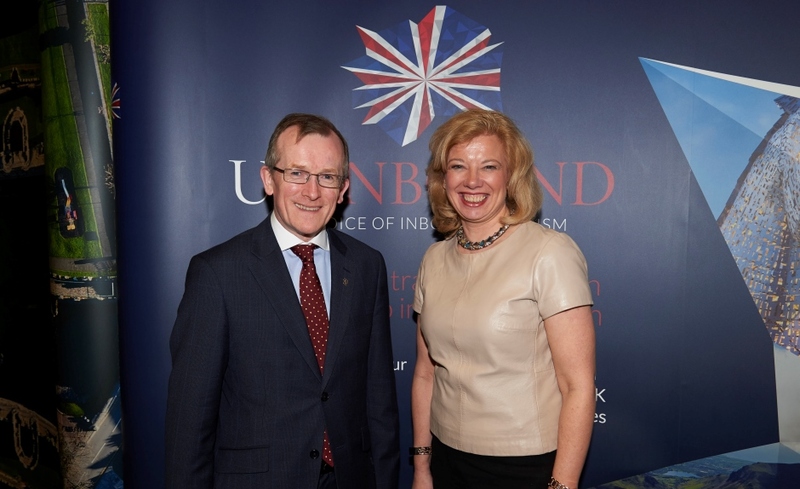 Niall Gibbons, CEO of Tourism Ireland, and Deirdre Wells, CEO of UKInbound, at ExploreGB in Brighton. This entry was posted in Ancient East, Best Attractions in Ireland, Best Places to visit in Ireland, Best restaurants in Ireland, Flights to Ireland, Fly to Ireland, Hotels in Ireland, Ireland Travel, Ireland Vacations 2017, Northern Ireland, Travelling around Ireland, vacation to Ireland, Wild Atlantic Way and tagged British-Irish Visa Scheme, ExploreGB, Tourism Ireland, VisitBritain. Bookmark the permalink.